"If turnips aren't your thing, then Japanese turnips will definitely change your opinion. Japanese turnips are normally used for salads, and they taste great with just some sea salt sprinkled on them. Unlike most other turnips, these are mildly sweet and crunchy, almost like radishes. This Indian-style curry, or korma, is a rich, creamy and flavorful entree that pairs well with rotis and rice." Place turnips, potato, and diced tomato in a large saucepan. Add 1 cup water and turmeric. Bring to a boil, reduce heat, and simmer until vegetables are tender, about 15 minutes. Heat 1 teaspoon canola oil in a skillet over medium heat. Stir in red chiles and green chiles, 1/2-inch cinnamon stick, pearl onions, coconut, coriander, cashews, cardamom pods, cloves, 1/2 teaspoon fennel seeds, and cumin seeds. Cook, stirring constantly, until spices are fragrant and coconut starts toasting, about 3 minutes. Remove from heat. Transfer to a spice grinder. Add cilantro, mint, and 1 teaspoon water; grind until a smooth paste forms, adding more water as needed. Heat 1 teaspoon canola oil in a large skillet over medium-low heat. Stir in 1/2 teaspoon fennel seeds and 1-inch cinnamon stick; cook for 30 seconds. Add minced garlic, ginger, and curry leaves; cook and stir until garlic and ginger are fragrant, about 2 minutes more. Pour cooked vegetables and spice paste into garlic-ginger mixture and bring to a boil. Add more water if curry is too thick. 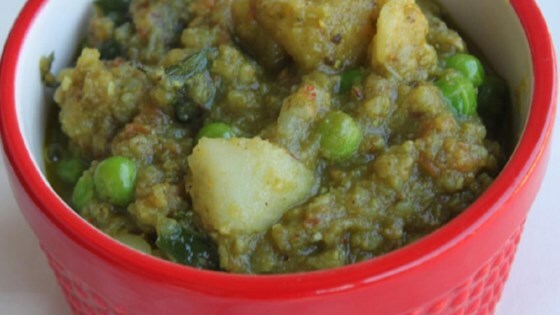 Mix in green peas and salt, reduce heat, and simmer for 10 minutes more. This recipe was submitted by Eat, Live, Burp in collaboration with the OxBox Project: food bloggers creating delicious recipes featuring Oxbow Farm vegetables. If you can't find Japanese turnips, look for baby turnips instead. If you're sensitive to spicy foods, reduce the number of chile peppers in the spice paste and seed Thai chiles before using.